The July 22nd Beauty Pageant has been sold to an unsuspecting audience as a scholarship financing scheme, sponsored by the Jammeh regime and organized by the Basic Education Ministry under the personal supervision of the Basic Education Minister, Fatou Lamin Faye. The claim is factually untrue from what we now know about the beauty pageant. The Basic Education Minister personally scouts the length, breadth and every nook and cranny of the country, in search of the most beautiful - not the smartest - of our children to parade in the catwalk in Kanilai in the presence of Babilimansa, Nasurudeen Jammeh who ultimately decides the winner and the runners-up. After selecting the winners, they are not offered scholarship immediately (most are never awarded scholarships) but are instead promised jobs as "protocol officers" in the Office of the President" were they are expected to perform anything and everything but protocol duties. They are there to do "whatever the president desires." The revulsion in narrating this beauty pageantry makes it impossible to repeat what we have already addressed in previous blogs,the latest being as recently as early in the week which you can access here. Gambians know better. 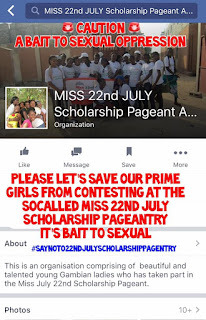 The July 22nd Beauty Pageant is not about a scholarship program for our daughters. In fact, most of the winners end up being thrown out of State House after being sexually abused. This must stop. We are, therefore, demanding that Yaya Jammeh, Fatou Lamin Faye, he Basic Education Minister, Isatou Njie-Saidy, Vice President get out of the beauty pageant business. The government has more pressing and urgent matters to address at a time when the economy is in serious decline and unemployment, especially among the youth of the country, it as it highest levels since Jammeh seized power illegally in 1994. It is not only the economy that is under performing. The performance of the Ministry of Basic Education is equally dismal, mirrored by the consistently and persistently poor results of our students in regional exams. The pageantry has become a sandal that the regime of Yaya Jammeh cannot afford to ignore. Cultivating promiscuity by exploiting the vulnerability of our daughters and granddaughters for the sexual gratification of Jammeh and his band of sexual predators is both illegal and immoral. Integrating this scheme into the annual school calendar threatens the integrity of Gambia's educational system by further weakening the curriculum that should emphasis academic excellence and not the physical endowment of our children. The reestablishment of the Scholarship Advisory Committee in the Ministry of Education through which students can apply for scholarships based on their exam results would be the simplest and most efficient (cost wise) to addressing a scholarship award scheme. 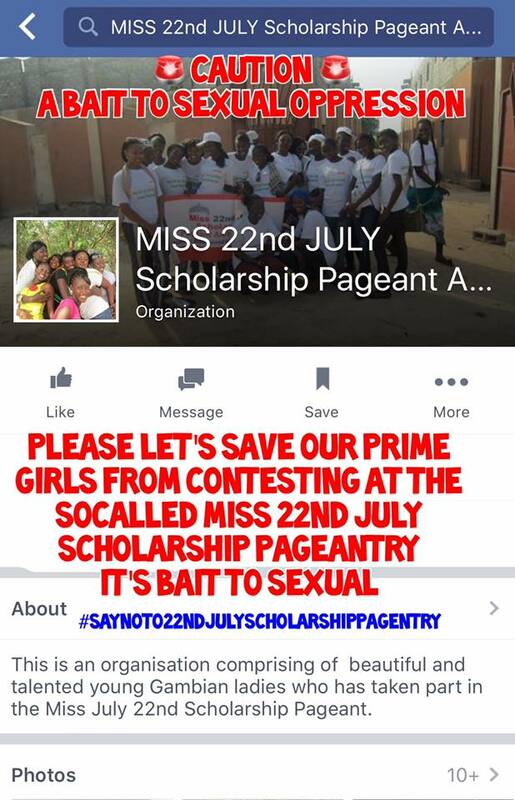 The July 22nd Beauty Pageant has no place in our educational system, given what we now know about the scheme. We hope the powers that be will see it as the decent and moral thing to do. This sexually exploitative scheme will continue at the detriment of our young if parents continue to support the 22nd July Beauty Pageant. They must, therefore, stop encouraging their young daughters from participating if they are to protect them from the dangers that they are likely to expose themselves to at the hands of those the Pageant was designed to benefit. The primary duty of any parent is to protect his or her child against danger. The 22nd July Beauty Pageantry is one such danger that your daughters must be protected against. 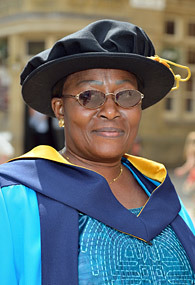 Prevent them from participating in any future pageantry organized by Yaya Jammeh or his agents. Educate them. Do not exploit them, sexually.